Happy Tuesday!! I am on the brink of sharing a whole bunch of awesome exciting news with you folks, but in the meantime will continue letting the world turn at a normal pace. I'm here to share my last goals recap for the season, as the Choose Your Own Adventure linkup is taking a summer hiatus. And, since I'm a week late to post, I may very well be the last person to post about their May goals! This seemed like an easy one for a bookworm. The irony, of course, is that I read a wee bit less than usual this month and was too swamped with life happening around me to push myself to stop and read for the sake of the linkup. Which, let's face it, is really unusual for me. It's often the blog pressure that gets my sh*t done! My goal was to have all the books I plan to read, have already read, and and am in the process of reading up to date online. I'm fairly consistent at updating my Already Read list, and got a bit better at updating my Currently Reading list... but my To Be Read list couldn't possibly be up to date. I have a plethora of books I am "going to read next", and there's no way a reading list would even be accurate. With that in mind, I gave myself an A equivalent. Because, life. This was actually pretty fun, but didn't go as far as I was hoping. I will likely keep this going throughout the summer, while I also re-evaluate some of the other blog series I've started and stalled on. I have read SO MANY BOOKS you guys. I don't know why these posts have been so slow to come to fruition!! I have been reading a short story collection by Richard Wagamese, which I am loving. I also bought a book by local gem Amy Jones, who I be-fan-girled via Twitter and almost met at a sushi restaurant once. In my defence, I ordered Amy's book with something that delayed the shipping so I didn't have time to crack it open as part of the May reading madness. But rest assured that will be read before the sun goes to hibernate for the 8 month Thunder Bay winter. 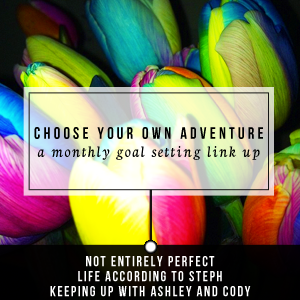 I'm linking up with Not Entirely Perfect, Life According to Steph, and Keeping up with Ashley and Cody blogs for the last time before the summer hiatus. Let's see what trouble I can get into during the break! I think you did great! My to be read list is never up to date - it changes daily! Fabulous job! I checked out your links to your book pledge pages, I love that it says how many you're on pace for for the year. You'll definitely hit 50, I think 41 is a lie. You're already rocking.